Well, would you look at that? It’s Perfect Picture Book Friday again! “Yippee!” said the birthday pencil. “Slammin’,” siad the basketball pencil. Brief Synopsis: Ms. 2 sets her pupils on the story path and let’s them loose to write their very own stories. 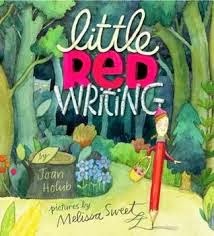 The other pencils stick to what they know about, but Little Red wants to write “a story about bravery because red is the color of courage.” With a basket of 15 red words from Ms. 2 to use in case she runs into trouble, Little Red sets out to find adventure. Before we all head off to read all the other Perfect Picture Books, I’d just like to let you know that on Monday we’ll be having a special guest! She’s pretty entertaining, so you won’t want to miss her debut appearance! Would You Read It Wednesday #106 – The Light Bulb And The Lab Coat (PB) PLUS The August Pitch Pick Winner! Meet Charlotte Gunnufson – Author Of Halloween Hustle!